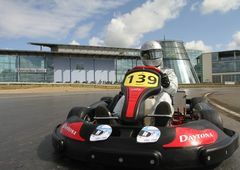 The inaugural ‘Henry Surtees Brooklands Team Challenge’ charity kart event will take place on Wednesday 4th July 2012 at Mercedes-Benz World. The endurance race and following Champagne reception will play host to star names from the world of motorsport. One hundred percent of the funds raised will go to the Henry Surtees Foundation and Brooklands Museum. The Henry Surtees Foundation is supporting the Kent, Surrey & Sussex Air Ambulance Trust. Mercedes-Benz World and the Brooklands Museum together provide an iconic venue for the inaugural ‘Henry Surtees Brooklands Team Challenge’. Following the 2-hour endurance kart race, which is hoped to be both competitive and fun, there will be a Champagne and Canapé reception hosted by Steve Rider and Henry Hope-Frost. The Challenge prize giving ceremony will take place during the reception, in addition to staged interviews with some of the attending drivers and personalities, an auction of some very special items donated to the Foundation especially for this event will be carried out by Malcolm Barber of Bonhams. Team entry for the Challenge is £1,000.00. Non-racing supporters are invited to come along and watch the racing, enjoy the Museum and Mercedes-Benz World. Tickets for the Champagne and Canapé Reception are available for a minimum donation of £40.00. Adrian Bell, Chief Executive of the Kent, Surrey & Sussex Air Ambulance Trust says, “We are delighted to have the opportunity to work with the Henry Surtees Foundation and particularly value its support for our life-saving service. As an emergency medical service we see a significant number of head injuries and applaud the foundation for the work that it does with young people and in helping victims of such injuries.